Here you can watch paintings in progress, or enjoy a preview of newly-completed images that are fresh off the easel. This is often the first place where you’ll see a painting or pencil drawing that may come up for sale later on. If you would like to know more about any of the pictures shown here, please feel free to contact us. Paintings sometimes disappear quickly, so act now to avoid disappointment! If you'd like to be told when Colin has completed a painting or drawing of a particular subject (perhaps an otter, an eagle, or a favourite landscape), why not drop us an email? You will then have first sight of any new pictures that we think might interest you, with the option to purchase. 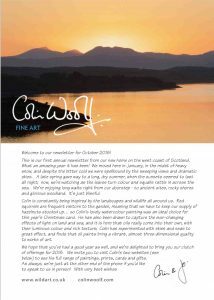 Remember to check Colin's Oil Painting site and his Facebook page for updates as well. 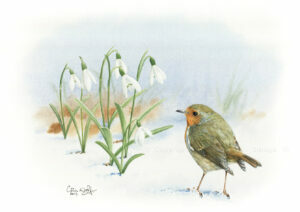 Well, orders are still coming in for Christmas cards and we still have a few original pencil drawings for sale. But the main focus has been getting the pictures ready in time for Christmas. 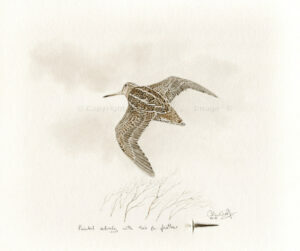 The one that has been occupying my mind, is the request for another Snipe pin-feather to match an existing one. Not that it is not a pleasure to do, just that I can vividly remember the difficulty in completing the last one that I did a few years ago. The pin-feather of a snipe is long, thin and very soft, so producing fine lines of branches for example is not at all easy, as it is so soft you have to apply a lot of pressure to get any paint onto the paper and then all of a sudden it springs away in another direction. At last it is finished. Could this really be the last pin-feather painting to come out of the studio ? I have learnt to never say never, but I try to paint in a way that stretches the ability and I dislike repeating the same thing. I have painted with over 15 different species of bird's feathers and achieved some amazing epic challenges with 5 different species on the same piece of paper. But for now I feel that my art has taken a new path with different challenges and for me more excitement in what I can achieve with light and landscape. I am ashamed to see that it is almost exactly a year since I made a post here! I shall make an effort to better that. We have just overhauled the software we use to send out our monthly Newsletters and are very please with the new one - check out MailPoet if you wish - so simple and intuitive. Our new Christmas cards have been designed and the first supplies will arrive soon, they are now on the shop. Our next task is to create our annual postal Newsletter which goes out to all our mailing list (not just the email list), if you are not on either list then drop us an email with your details and you will then be able to take advantage of special offers etc. 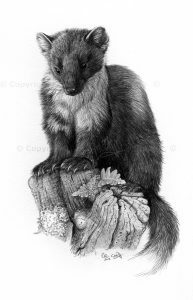 This was one of the latest pencil studies of our new visitor - a beautiful Pine Marten. Building up stock for my first show this season at the Three Counties - here is the latest one, this time another of my favourite birds and it is nearly 4 years since the last time I painted one ! The show season is almost upon us and I suddenly realised that I don't have a woodcock painted with a feather for sale - so here is one I have just started. Yes, it is that time of year again not such a special birthday this year ! But, I do have a challenge to show you, I always told people it was impossible to use a pin-feather to paint in oils and it nagged at the back of my mind for many years - was it actually impossible ? The techniques I learned from using the geese pin-feathers made it possible, I am sure if I hadn't tried to use the geese feathers I would not have been at all successful. Don't forget our Mad March discount code ! The snowdrops this year have been wonderful, and although we haven't had as much snow as we usually do they still make a great show. Our Robin has been singing for his territory and is now defending it aggressively from all comers, but looking at his face you would never know. Back into the painting (with frequent stops to pack up parcels for Christmas). I have been working on this one for some time now, some pictures just take so much longer than you think 🙂 Getting the evening light just right was a real challenge. A couple more unusual subjects will follow this painting. Here is a little taster of the new Oil Painting collection which I have been working on over the last few months, these will be unveiled at the Glaziers Hall at the end of October, those who receive our annual postal Newsletter will get a preview in there. Framing suppliers are notorious for offering great mouldings and then discontinuing them, so we are constantly sourcing and re-sourcing our frames. The selection that we offer is always of the highest quality, and we believe that they will suit a wide range of images. If you're ordering a print and require a frame, we hope you'll enjoy the process of choosing one. If you'd like more information about mouldings, or if you're looking for something very specific, please just give us a call. Delivery of all our framed items is by secure, reliable courier, and when it comes to packing Colin is a world-renowned expert! Colin is available as a professional speaker for societies such as art groups, ornithological societies and wildlife clubs. 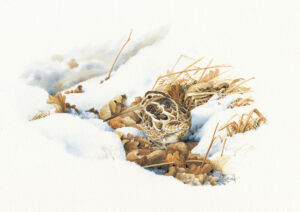 He will do more than just talk - he will demonstrate his painting techniques and he even offers full day workshops. His demonstrations have been described as revolutionary and eye-opening. Give us a call if you'd like to book him as a speaker! If you'd prefer tuition that is more focused on your own personal ambitions, Colin also offers one-to-one lessons, concentrating on the areas where you'd like to improve. At least three of his former pupils are now selling their work professionally. If you'd like to discover or refresh your artistic talent, why not contact him to discuss it further?